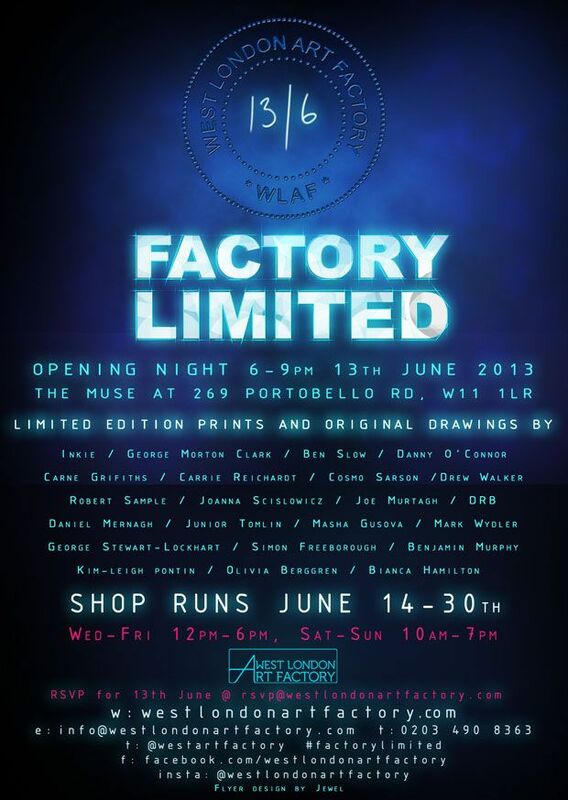 Bringing together some of the UK's finest artists, West London Art Factory is proud to announce the opening of it's second pop-up shop, FACTORY LIMITED. Positioned on Portobello Road in the heart of West London, FACTORY LIMITED will be focused on limited edition and hand finished prints as well as affordable original pieces. We'll have work from: Inkie / George Morton Clark / Ben Slow / Danny O'Connor Carne Grifiths / Carrie Reichardt / Cosmo Sarson /Drew Walker /Robert Sample / Joanna Scislowicz / Joe Murtagh / DRB / Daniel Mernagh / Junior Tomlin / Masha Gusova / Mark Wydler / George Stewart-Lockhart / Simon Freeborough / Benjamin Murphy / Kim-leigh pontin / Olivia Berggren / Bianca Hamilton The shop opens on Thursday 13th June 201 and runs through to Sunday 30th June 2013.